Are you looking for an excellent Tatted Lace site? This used to be a great 'Tatted Lace' site that attracted a great deal of traffic. Unfortunately the original owner has decided to shut it down. With ethereal wings of white tatted lace, and a gold halo which frames the pearl faced angel, this pin will add glimmer to any outfit. There is a tiny handmade rose at the angel's waist, and the entire Angel Pin measures approximately 2" long x 1 1/4". Leaves of gold frame this Dogwood Broach with mauve round tatting and a black cameo and delicate handmade rose. Dogwood Broach measures approximately 2 1/4" x 1 1/2" long. 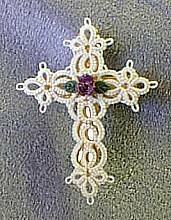 With the delicate open lace work that tatting can create, this Cross Pin has at the center a tiny handmade plum rose. The Cross Pin measures approximately 1 1/4" x 1 5/8" long. 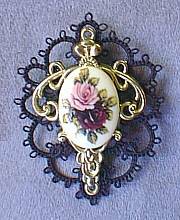 This Double Rose Cameo Broach has painted roses in burgundy and pink on a gold toned pin with a scalloped border of black tatting surrounding it. 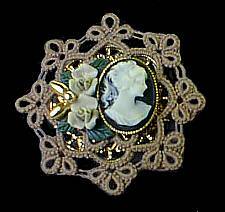 The Double Rose Cameo Broach measures approximately 2" x 2 1/2" long. Delicate swirls of Country Blue tatting with the gleam of gold shimmering through, surround a blue cameo and two navy handmade roses. 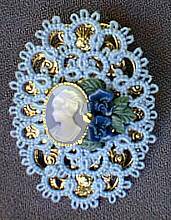 This Country Blue Cameo Broach measures approximately 1 1/2" x 2" long. On a base of textured gold is this Black Tatted Shuttle Broach with two white roses in the center. 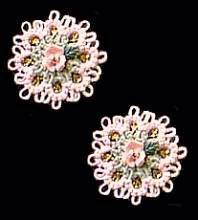 The delicate lacing of the tatted ovals is in the shape of the shuttle tool used in tatting. Black Shuttle Broach measures approximately 2 1/2" wide x 1 1/4". 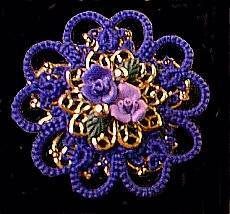 Purple Five Point Pin is made from a deep purple circle of tatting, and set on a centerpiece of gold are handmade roses in lavender and purple. This Purple Five Point Pin measures approximately 1 1/2" x 1 1/2". Taupe tatting frame this Large Black Cameo, with two handmade ecru roses and gold beads as accents in this delicate swirl of lace. This Large Black Cameo Broach measures approximately 2" x 2". 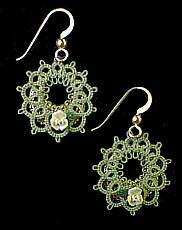 With a shimmer of gold coming through the lace swirls of the olive green tatting, these drop earrings with gold-filled wire and have handmade ivory roses. Olive Green Drop Earrings measure approximately 1" round. 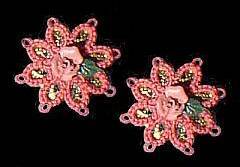 Round lace pink tatting with a center of green tatting surround this handmade pink rose. These Pink and Green Circle Earrings have a surgical steel posts, and measure approximately 3/4". These Star Circle Earrings have the shimmer of gold seen through the dark mauve thread tatting that encircle a handmade mauve rose. Star Circle Earrings have surgical steel posts, and measure approximately 3/4". 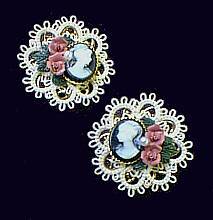 These delicate cream tatted earrings with lace picot loops, have a black cameo and two mauve roses at the center. Round Picot Earrings have surgical steel posts, and measure approximately 1". Want to add your Tatting site? This Tatting Webring is owned by Elizabeth C. Zipay. Want to add your Lace site?